This book could save you avoidable heartache in your life, in the lives of your loved ones, or in your ministry. It is a companion to the book on Christian deliverance, titled Major Christian Deliverance Principles: Keys for Self-deliverance and Ministry. 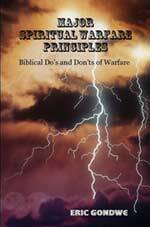 The deliverance book addresses major principles on Christian deliverance while this one addresses major principles on Christian spiritual warfare. The two books share Chapter 1 while beyond that they have totally different content altogether. You will learn on spiritual warfare the do’s and don’ts, what works and what doesn’t, what’s biblical and what’s not, what brings victory and what invites attacks. By the end of the book you’ll be able to distinguish between the two worlds of biblical truth and misinterpretation or error on Christian spiritual warfare teachings. The book cautions on the potential dangers, consequences of applying erroneous teachings, and points to what bible based spiritual warfare principles are. The book is empowering on major biblical principles on spiritual warfare. It is also valuable in avoiding the spiritual attacks that are caused by applying erroneous teachings on spiritual warfare. It’s better learning through the easier way of understanding than through an avoidable shipwreck or crisis that enforces a change of perspective - like some of us once faced. You will be amazed at the findings as we test the spirit and truth from each of the two worlds of spiritual warfare principles. Needless to say that the fruits or consequences from each version of teachings speak for themselves. The biblical interpretation of spiritual warfare principles endorsed by this book are supported by the entire 2000 year church history -from Christ’s time up to now. On the other hand, the new end-time spiritual warfare teachings that advocate for direct confrontation with Satan emerged in the 1980s. They are mainly prescribed by two or three denominations among our various evangelical branches. Evangelicals include Charismatics, Baptists, Pentecostals, Methodists, AME, Presbyterians, Assemblies of God, Lutherans, and so on, including most non-denominations. Our uniting beliefs include emphasis on spiritual rebirth through accepting and following Jesus Christ as Lord and Savior, and in upholding the inerrancy of the bible. Together we constitute the body of Christ, the church of our Lord that transcends denominational and geographical boundaries. Beginning in the 1980s we, in some evangelical circles, have followed matters we have called spiritual warfare teachings with little or no biblical scrutiny. C. Peter Wagner is considered among the chief architects of the spiritual warfare doctrine of direct confrontation with evil spirits. Wagner went on to establish the Wagner Leadership Institute where Strategic Level Spiritual Warfare (SLSW) was taught as a major warfare strategy of winning territorial spiritual warfare against spiritual principalities. Scriptures have been taken out of context, given new meaning and the new spiritual warfare teachings became what we have today - among some of our fellow believers. The zeal and sincerity for God’s kingdom is not being disputed among advocates of teachings that misinterpret scripture. Our main concern is the fact that the body of Christ cannot afford erroneous and harmful teachings. As watchmen and women we have a mandate to reveal erroneous and harmful teachings circulating in the body of Christ. The new movement in the eyes of its advocates began to be known as the “Third Wave,” or “Signs and Wonders” movement. They called it a new move of the Holy Spirit in the body of Christ. Says Dr. Wagner, “The first wave was known as the Pentecostal movement, (p.16) the second, the Charismatics (p.17), and now “I see the Third Wave distinct from, but at the same time similar to the first and second waves.”(p.18) C. Peter Wagner, The Third Wave of the Holy Spirit: Encountering the Power of Signs and Wonders Today. (Note that due partly to heavy criticism from fellow evangelicals this book is out of print. For any reference purposes used copies are available at online stores like Amazon.com and Half.ebay.com). The Third Wave movement not only introduced the new spiritual warfare teachings, it also emphasized that baptism in the Holy Spirit is verified through speaking in tongues. No tongues no baptism, no heaven, even if you were Billy Graham. Although speaking in tongues re-emerged in the early 1900s it received a new association by the Third Wavers in the late 1900s. Says Dr. Wagner, “The Third Wave is a new moving of the Holy Spirit among evangelicals who for one reason or another have chosen not to identify with either the Pentecostals or the Charismatics. Its roots go back a little further but I see it as mainly a movement beginning in the 1980's and gathering momentum through the closing years of the 20th century. “I see,” says Wagner, “the Third Wave as distinct from, but at the same time, very similar to the first and second waves. They have to be similar because it is the same Spirit of God who is doing the work. The major variation comes in the understanding of the meaning of "Baptism in the Holy Spirit" and the role of tongues in authenticating this. I myself, for example, would rather not have people call me a Charismatic, I do not consider myself a Charismatic, I am simply an Evangelical Congregationalist who is open to the Holy Spirit working through me and my church in any way He chooses,” C. Peter Wagner, cited by John F. MacArthur Jr in his book Charismatic Chaos. Wagner disassociates himself from being a Charismatic or Pentecostal not primarily because of any doctrinal distinction, but primarily because of the stigma attached to such names (during the 1980s). But not only did Wagner’s teachings gain prominence among our Charismatic and Pentecostal evangelical churches we also became the major crusaders of his teachings. Without the support of Charismatics and Pentecostals Wagner and other pioneers of the non-biblical spiritual warfare teachings would have largely gone unnoticed. Sincere believers of high prominence endorsed the non-biblical spiritual warfare and what followed is what we have today. The deception flood of the erroneous spiritual warfare teachings got so high that many of us easily found scripture to back up our resolve to directly fight evil spirits. Believers were zealous in their resolve to directly confront demonic spirits that scripture was easily taken out of context without even realizing it. Some are still zealous in the non-biblical spiritual warfare and deliverance teachings. The consequences among believers of following these teachings have been disturbing and unfortunate. The mistaken understanding has been that spiritual warfare implies directly confronting Satan and his demonic spirits (fallen angels), making verbal proclamations in thin air against them, binding them up in the spirit world, in geographical territories, and so on. This, it has been assumed, was our responsibility according to the bible. Unfortunately the consequences speak for themselves on whether or not the bible supports this belief. This book covers on the potential dangers, consequences and points to the true biblical spiritual warfare we have always followed throughout church history. True biblical spiritual warfare is what we have held all along before the misinterpretation came in. It maintains that God fights our battles us we seek his intervention rather than confronting Satan ourselves. Our role in dealing with evil spirits in the spirit realm is indirect in nature, while God’s role is direct. The only exception is when casting out evil spirits out of people. The book outlines all these areas. Some changes towards biblical spiritual warfare and deliverance have been occurring as we have been learning from these unfortunate experiences. However we still have some way to go as fundamentalist evangelicals. This book, among others, facilitates our return to biblical principles of spiritual warfare. Without a true understanding we will continue facing avoidable consequences that our mistaken spiritual warfare teachings invite. This book is therefore, not about exposing cults but about false doctrines in the body of Christ. It is primarily about revealing and correcting one area of false doctrines: on spiritual warfare and deliverance principles. The book uncovers the errors on spiritual warfare and deliverance principles that have entered the body of Christ trapping many sincere believers who practice them. The biblical truths contained in this book facilitate their freedom from all consequences of the false doctrines on spiritual warfare teachings. One of our most recent false beliefs in the body of Christ are on spiritual warfare and deliverance teachings. This book and its companion on deliverance, titled Major Christian Deliverance Principles: Keys for Self-deliverance and Ministry, reveal how and why the spiritual warfare and Christian deliverance errors have among the worst consequences among false doctrines currently circulating in the body of Christ. Thankfully there is a way out and there are actually bible based principles that bring freedom. The vicious cycle of strange problem after another befalls many sincere, heaven destined believers who assume scripture authorizes us to fight Satan ourselves. Thankfully there is a solution to whatever befalls anyone trapped in this false doctrine. It is in ceasing the practice of the assumed spiritual warfare and fighting the enemy the way scripture authorizes us to. This is through indirect confrontation. Indirect confrontation is what scripture prescribes for us. Chapter 4, “True Spiritual Warfare = Indirect Confrontation,” shows how God has made indirect confrontation as our only spiritual warfare. Indirect confrontation implies that we do not fight with Satan and his evil forces by approaching them directly. We confront them by applying indirect means and ways that God has established for us. Applying and fulfilling our required indirect roles secures our standing before God and allows him to directly act on our behalf. Attacks from Satan against us become God's battles as we obey and fulfill the roles required of us. In this spiritual battle God’s role is direct in nature as he is able to directly deal with the spiritual forces unseen to our human eyes. God through his heavenly government that has the authority and access to the kingdom of hell is able to directly deal with the enemy and his works. Indirect confrontation is how we can petition God in the name of Jesus to fight on our behalf over our lives or the lives of others. Indirect confrontation seems simple yet it has the most powerful deliverance ministry tools given to us. Our weapons of warfare, which from a correct scriptural interpretation are indirect in nature, are the most powerful weapons God has entrusted us with. Scripture says they are more powerful than human weapons, able to devastate the activities of Satan on earth. May we effectively use them in setting captives free and practicing true deliverance ministry. Our God is almighty, all sovereign. This makes him in charge of everything, including over Satan. He thus has not left his throne to Satan to do whatever he pleases. Satan operates within the boundaries that God allows and has set-up as spiritual laws. Outside these boundaries he has NO means, authority, nor power to enforce his wishes. That is why he uses traps to bring people into his boundaries -so that he can attack them. Within his boundaries he gains legal access to attack in whatever way he has access to –spiritually, socially, materially, physically, etc. The methods he uses to gain legal access to people include deception, sin and ignorance. The false teachings on spiritual warfare and deliverance are therefore among his doorways. Other traps he uses among believers include love of money, pursuit of worldly pleasures, power, fame, knowledge, etc. Deliverance comes when people understand that direct confrontation with Satan takes us into his forbidden territory. Being outside the boundary brought by the assumed spiritual warfare ends his legal access to an individual or ministry. It closes the door he used to hinder a person’s life. God can still permit Satan to operate outside his boundary, e.g. in the case of Job. However, Satan had to first obtain permission from God because all avenues of legal access were closed. The same applies to all believers who walk in truth and are under the righteousness of Christ. Satan can only gain entry into our lives only after getting permission from God. God giving Satan permission is an exception rather than a rule. God does not delight in our affliction, especially in areas that Satan has no legal entry. The ultimate outcome when God gives Satan permission always brings victory rather than defeat for the believer and for God’s kingdom. We know how Job ended up with more than he lost. Similarly, our Lord Jesus got the greatest victory for all humanity after being innocently oppressed and killed by Satan. God ultimately upholds his faithfulness and righteousness.